I know there is another thread on sword forum that shows illustrations of exisiting handles pieces, but I can't find it. I'll keep looking though. Very interesting hilts. Thanks for posting, Jason. 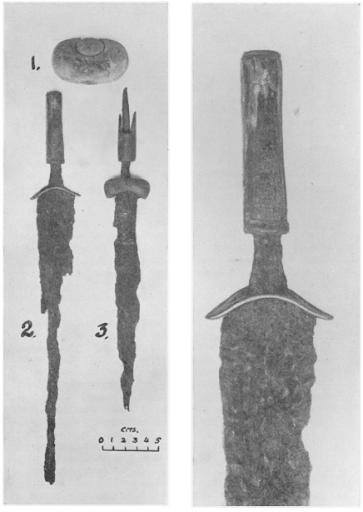 maybe someone have more information about the swords...Publications, photos.Who have this "A Classification of Pre-Viking Irish Iron Swords"? An Early Iron Age Sword from Lough Gur, Co. Limerick. Ireland, though outstanding in quality, are poor in quantity. and Connacht, the country has only a few sporadic finds to show. it was recently discovered by the present writer. blade by oxidation had loosened the guard. guard, must have been originally 0.6 cm. wide at the centre. Derravaragh, Co. Westmeath, is too doubtful to be included. Division of the National Museum, that it is made from a sheep metatarsal. dating in Ireland is not quite the same. Ballyshannon, Co. Donegal (Nat. Mus. of Ireland). thicker and less beautiful, but the line of descent is unmistakable. date between 75 and 50 B.C. for it. Good man Panda. Bring it on.